Your adventurous settlers seek to tame the remote but rich isle of Catan. Start by revealing Catan's many harbors and regions: pastures, fields, mountains, hills, forests, and desert. The random mix creates a different board virtually every game. ● No two games are the same! ● Embark on a quest to settle the isle of Catan! Guide your settlers to victory by clever trading and cunning development. Use resource combinations- grain, wool, ore, brick, and lumber-to buy handy development cards and build roads, settlements, and cities. Acquire your resources through trades, cards, or lucky dice (even outside your turn). But beware! Someone might cut off your road or buy a monopoly. And you never know when the wily robber might steal some of your precious gains! 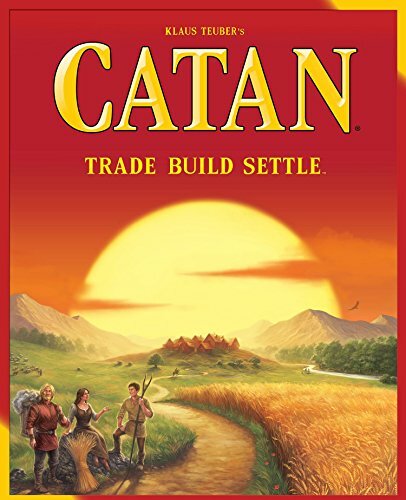 Catan (aka The Settlers of Catan) has been awarded with "Game of the Year," "Hall of Fame," and even "Game of the Century" honors in Germany, the United States, and a host of other countries worldwide. An international favorite, it's been called the "Perfect Social Game." Product Info Ages: 10+ Players: 3-4 Playing Time: 60 minutes Designer: Klaus Teuber Art: Volkan Baga & Harald Lieske & Stephen Graham Walsh Made in: U.S.A. Components 19 Hexagonal Region Tiles 6 Sea Frame Pieces 9 Extra harbor Pieces 20 Wooden Settlement Pieces 16 Wooden City Pieces 16 Wooden Road Pieces 95 Resources Cards 25 Development Cards 4 Building Cost Cards 2 Special Bonus Cards 18 Number Tokens 2 Dice 1 Wooden Robber Pawn 1 Rulebook & Almanac. If you have any questions about this product by Catan Studios, contact us by completing and submitting the form below. If you are looking for a specif part number, please include it with your message.